An unusual close-cropped devotional painting featuring Christ with four soldiers placing the crown of thorns on his head, forming a masterly study of faces and hands. The account of Christ’s mocking and crowning with thorns is given briefly in the Gospel of John, chapter 19. 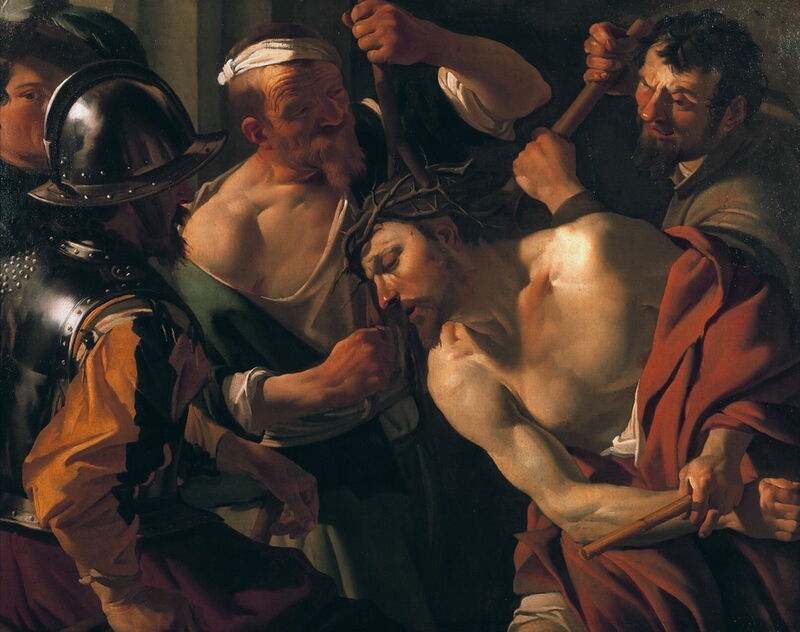 After he had been flogged, the soldiers wove a crown from thorns and put it on his head. They then dressed him in purple, a colour often confined to royalty, and mocked him by calling him the King of the Jews, and striking him on the face. 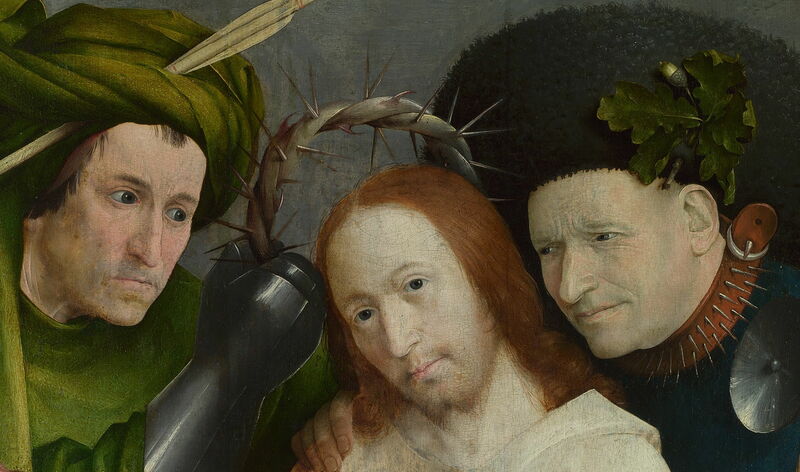 Bosch depicts this as the crown of thorns is pressed onto Christ’s head, immediately before he is dressed in a purple robe. Four men are shown around the head and body of Jesus Christ. Hieronymus Bosch (c 1450–1516), The Crowning with Thorns (detail) (c 1490-1500), oil on oak panel, 73.8 x 59 cm, The National Gallery, London. Wikimedia Commons. At the top left, a crossbowman dressed in a green cloak and wearing full armour on his right hand holds, in that hand, the crown of thorns, so as to place it on Christ’s head. This soldier has a steely look of determination, his lower jaw thrust forward, mouth closed. A crossbow bolt is tucked through the matching green turban on his head. 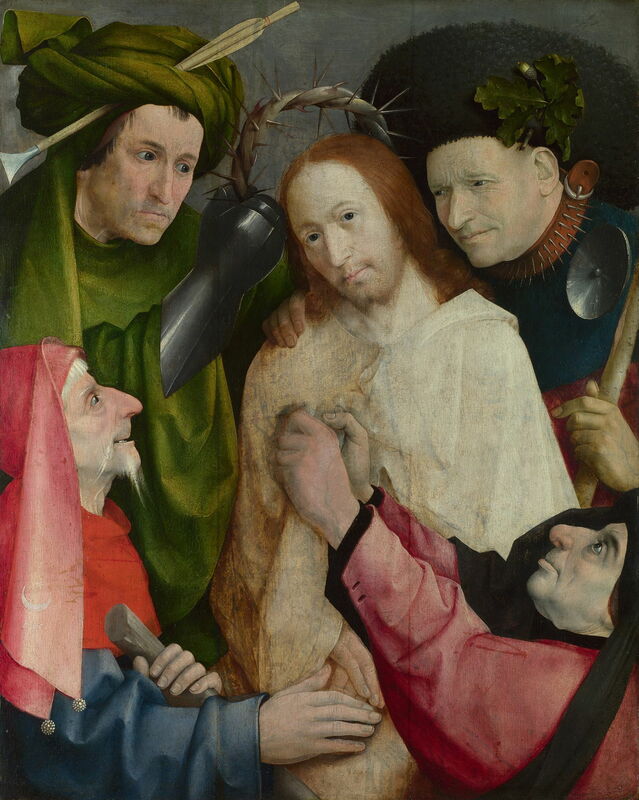 At the top right, an older man, whose right arm rests on Christ’s right shoulder, has a more concerned expression, his brows knitted, almost as if trying to reassure Christ. He wears a large black sheepskin hat with oak leaves and an acorn as a badge, a peculiar spiked leather collar which is buckled at his left ear, and in his left hand holds a birch rod. At the lower right, another older man is seen in profile, looking up at Christ, and clutching at his white robe with both hands. This soldier has a prominent nose, and his brows are raised. At the lower left, a much older man also appears in profile, looking up at Christ, his left hand holding the top of a stick, his right touching Christ’s body. His face appears excited but with a look of evil pleasure. His nose is hooked and prominent, his upper lip drawn back, and his mouth slightly open. He wears a red chaperon (scarf cap) which bears an emblem of a white crescent moon and star. His robe now looks blue, but was originally much more purple. Christ looks directly at the viewer, his face appearing calm and resigned. He wears a thin, white linen robe, from which his right hand protrudes, near the right hand of the fourth soldier. Behind them is a mid-grey featureless wall. Most paintings of this episode from the Passion show a much wider view, in which the figures are full, and there are other props to set – and distract from – the scene. Bosch has chosen an unusual and very close composition, which draws particular attention to the faces of the five figures, and is intended for devotional use. Maarten van Heemskerck (1498–1574), The Crowning with Thorns (1545-1555), oil on panel transferred to canvas, 99 × 138.5 cm, Frans Hals Museum, Haarlem, The Netherlands. Wikimedia Commons. 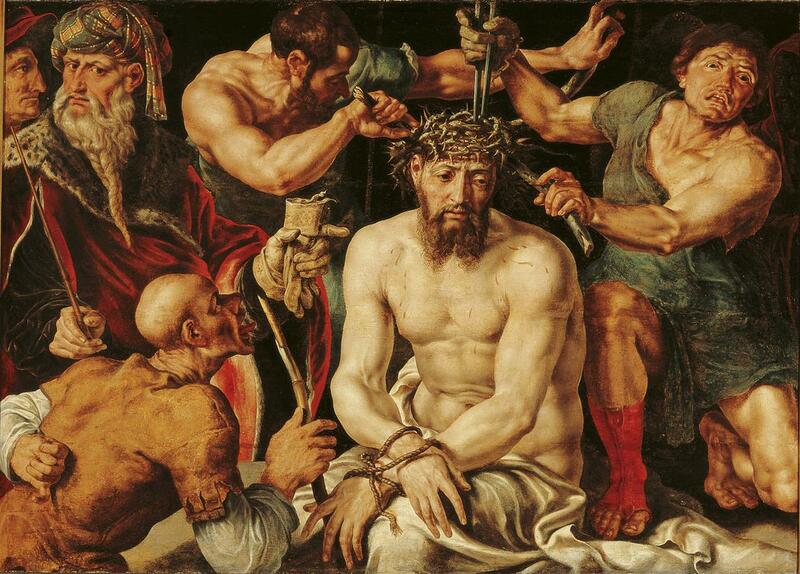 Although Maarten van Heemskerck’s rather later The Crowning with Thorns (1545-1555) shows some of the faces clearly enough to read the emotions of those involved, it is also very busy with many other distractions, making it far less contemplative. Dirck van Baburen (c 1594/5–1624), Christ with the Crown of Thorns (1623), oil on canvas, 106 × 136 cm, Museum Catharijneconvent, Utrecht, The Netherlands. Wikimedia Commons. Over a century later, Dirck van Baburen’s Christ with the Crown of Thorns (1623) goes much closer-in, but then manages to lose or conceal most of the faces apart from that of Christ, leaving the viewer reading body language alone. Ilsink et al. (2016) identify the crown as being composed of two different types of thorn, from the Christ’s Thorn (Ziziphus spina-christi) and a rose branch. The thorns of the first are long and straight, whilst the rose thorns are shorter and curved into hooks. Simple modern stereotypes do not do justice to the diversity of Roman soldiers of the day. The armies of the Roman Empire were largely raised from that Empire, and like Rome itself were ethnically rich and diverse. Bosch has used that to make each soldier quite distinctive in dress, role, action, and expression. This is important to the underlying story, as it establishes that you cannot simply ‘blame’ the Jews or the Romans for the Passion, and that Christ’s death on the cross was not just for one ethnic group, but for all mankind. The viewer is invited to imagine who these soldiers are: clues are most obvious, perhaps, for the man at the lower left, who is shown possibly as a Jew, but given the mark on his headdress may have been an Arab from the Middle East. Bosch also used a white crescent on red in the background townscape of his Ecce Homo (1475-85), for example. The reading of character from the face has been a controversial human fascination since it was first proposed by Zopyrus in the fifth century BC, in Athens. It remained popular throughout the Middle Ages, but was not fully codified until Lavater’s essays were published in 1772. Although we will never know whether it had any appeal for Bosch, this painting discloses more than a passing interest in the subject. Study of the underdrawings has been very rewarding. The first painting laid onto this panel was intended to be of Saint Christopher carrying the infant Christ on his shoulders, but that was abandoned. The final painting has also undergone considerable change in detail from its underdrawing. 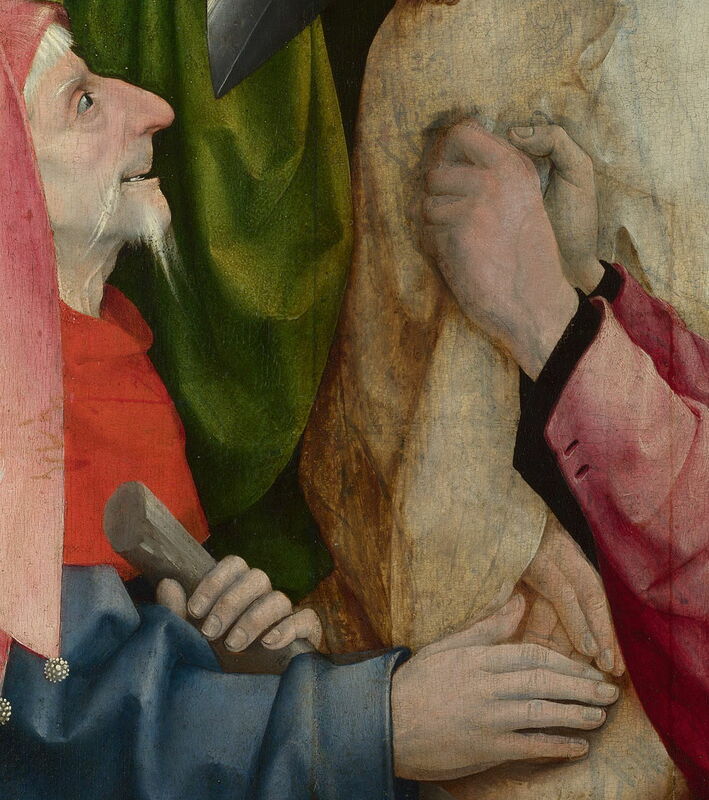 However, no overpainting seems to have occurred, so the image that we see now is that intended by Bosch. Matthijs Ilsink, Jos Koldeweij et al. (2016) pp 260-267 in Hieronymus Bosch, Painter and Draughtsman: Catalogue Raisonné, Yale UP and Mercatorfonds. ISBN 978 0 300 22014 8. Posted in General, Painting and tagged Bosch, painting, van Baburen, van Heemskerck. Bookmark the permalink.